The Nocona Indians were able to get over their disappointing opening game loss by crushing Venus in their home opener Friday night. The Indians crushed the Bulldogs 62-0, with all of the scoring coming in the first three quarters. Quarterbacks Hunter Fenoglio and Carter Horn combined to complete 11 of 13 passes for 134 yards and two touchdowns. Tighte end Jason Sparkman led the team catching four passes for 80 yards and two touchdowns. 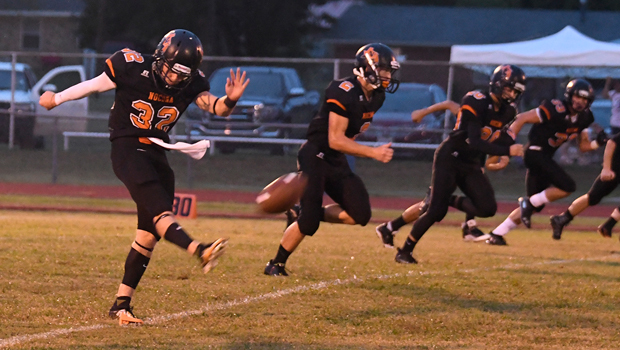 It was on the ground where Nocona hurt Venus as the Indians racked up 315 yards on only 34 carries for a six touchdowns from five different players. Tyler Richards led the team with 91 yards and scored one touchdown while Lane Geurin tied for the team lead by scoring two touchdowns on the ground. Defensively the Indians recovered two fumbles, with Joan Gomez scooping and scoring for 36 yards and a touchdown. Despite Venus being a bigger school district in 4A, they were a step down in competition for Nocona compared to the previous week. Keck knew he had to evaluate other factors besides just the overwhelming outcome. After being displeased with his offense in the first game due to what he feels was a lack of the basics, he felt he saw a lot of improvement in that area. To read the whole story, pick up a copy of the mid-week edition of the Bowie News.